On July 26th, SEGA confirmed on their Facebook page that Hatsune Miku: Project DIVA F will release in North America on August 27th. 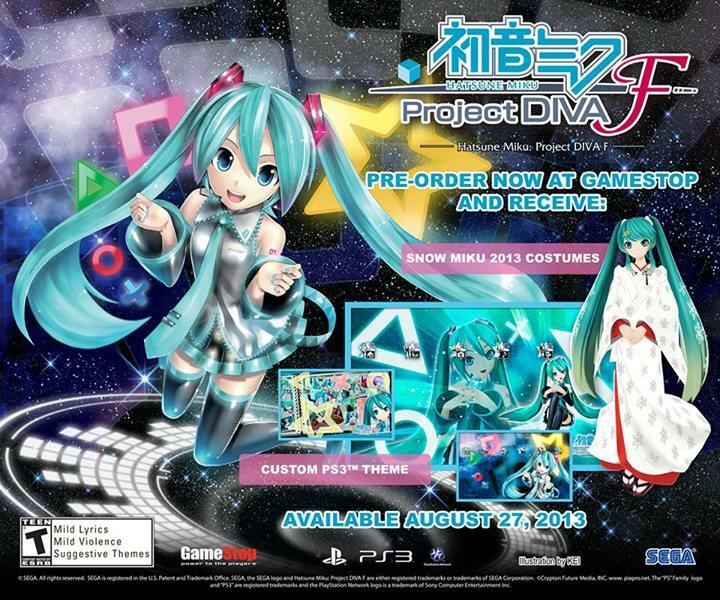 Those who pre-order the game at GameStop will receive an exclusive PlayStation 3 theme and the Snow Miku 2013 costume. The custom theme will feature 10 different backgrounds for your XMB. Create your own Miku videos in “Edit Mode” and share them online! Spend time with your favorite characters in the “Miku Room”! Pre-order Hatsune Miku: Project DIVA F now from GameStop.com, Amazon.com , or Amazon.ca .